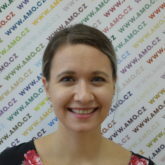 Kristýna Kalmárová worked in AMO as an intern of the ChinfluenCE international research project in 2018. She is a graduate of the Information and Library Studies at the Faculty of Arts of Masaryk University. During her studies, she attended internships at Tallinn University in Estonia and Hacettepe University in Turkey. Besides AMO, she currently works in the Spolek PELICAN, where she is involved in European projects devoted to the development of intercultural and language training tools. This profile hasn’t been updated since 31.12.2018.